Ed Ling has won Britain's first medal of the Shooting World Championships, clinching silver in the men's trap. 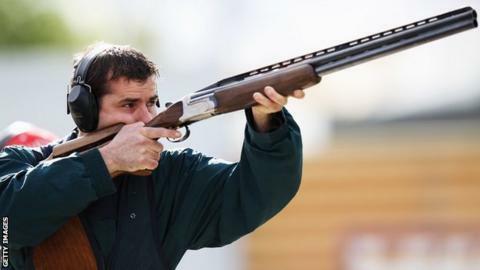 In qualifying for the final, the 31-year-old from Taunton was one short of equalling the world record of 125 clays and hit 14 out of 15 in the final. Ling and Erik Varga both shot 12 from 12 in the final, only for the Slovak to triumph in the subsequent shoot-off. Meanwhile, Nathan Hales pipped fellow Briton Jack Wilkinson to bronze in a shoot-off in the junior men's trap. Hales, from Kent, and Lincolnshire's Wilkinson then teamed up with Greg Towell to win silver in the junior men's team event. Ling's result also secured one of Team GB's first quota places for the 2016 Olympics in Rio. "I'm highly delighted to win one of the first quotas for GB," he said. "But it's mixed with a tinge of disappointment that I missed the 125 world record which I was really after." The championships are taking place until 20 September in Granada, Spain.